The left fawned over BarryO’s victory in 2008, describing the event as the coming of a ‘post-racial’ era in American history. In 2012, we have the distinct possibility of a true post-racial moment in American politics: two black Americans battling it out under the standards of the two major parties for the American presidency. Herman Cain is everything BarryO is not. He can talk — and make sense — without using a teleprompter. Cain reached great levels of success via hard work, foresaking the path of racial agitation and political machine cronyism BarryO chose. 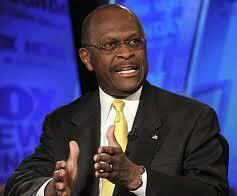 The time is overdue to plumb the mystery of Herman Cain’s “interesting, but” candidacy. Let’s start at the top—in the top-tier candidacy of Mitt Romney. Though he’s got the governorship credential, Mr. Romney’s emphasis in this campaign is on his private-sector experience. It’s good, despite the knock on Bain Capital’s business model. But measured by résumés, Herman Cain’s looks deeper in terms of working on the private sector’s front lines. The details of his career path are worth knowing. Pillsbury sold Godfather’s to Mr. Cain and some of his managers in 1988. He ran it until 1996 and served as CEO of the National Restaurant Association from 1996-1999. This June, Mr. Cain visited with the Journal’s editors and put the issue of health-insurance availability inside the context of the restaurant industry. He said the restaurant association tried hard to devise a health-insurance program able to serve the needs of an industry whose work force is complex—executives and managers, full-time workers, part-timers, students and so forth. Any conceivable insurance system would require great flexibility in plan-choice and design. To get the chance to take on BarryO for the big prize, he will have to first get past Mitt Romney and a crowd of ambitious GOP candidates. It appears Romney has developed quite a bit of respect for Cain, telling a New Hampshire audience to vote for either himself or Cain, because of their business experience. Mitt Romney: “That might be how some people might want to characterize what we did, but in fact we started businesses at Bain Capital, and when we acquired businesses, in each case we tried to make ’em bigger, make ’em more successful and grow. Some quick background: Private equity firms like Bain are known for raising money from outside investors; using that money to buy up struggling companies; restructuring the companies (think layoffs, slashing worker benefits, and selling off pieces of the business); and finally selling the (supposedly) leaner, meaner businesses for a profit. One particularly infamous type of private equity deal is the leveraged buyout, in which a private equity firm will borrow a huge amount of money to buy a company, thereby weighing down the purchased company with debt. Now, let’s pick apart Romney’s defense of Bain. When Bain took over companies, he said, “in each case we tried to make ’em bigger, make ’em more successful and grow” [emphasis mine]. Not so in the case of Dade International, a medical testing company acquired by Bain and Goldman Sachs in 1994. As Bloomberg reported, Bain cut 1,600 jobs from the company between 1996 and 1999 after merging the company with several others as part of Bain’s restructuring plan. In 1999, Bain and Goldman sold Dade International, as it was later called, for a profit, but left the company buried in debt. It filed for bankruptcy in 2002. Then there was the case of American Pad and Paper, an Indiana-based office products company. Bain bought the company in 1992, and seven years later, when Romney left Bain, American Pad had seen two US plants shutter, lost 385 jobs, and was hobbled by $392 million in debt. These are, of course, just two out of dozens of deals from Romney’s 15 years at Bain. Other deals—helping to launch office goods store Staples, strengthening Sports Authority—showed how Bain could indeed improve a company. But the Dade and Ampad cases contradict Romney’s statement that Bain was always focused on jobs growth and expanding companies. Going into the general election with GOP nominee Herman Cain — his impressive business credentials, his knowledge, his passion for the free market, and his communication skills — would put the party in a strong position to send BarryO AWAY.